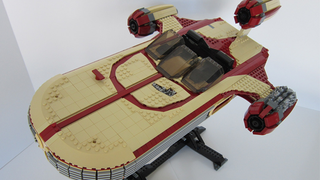 Most Lego Star Wars customisers tend to go for bigger bounties than the humble Landspeeder, but Flickr user Aaron Fiskum has done it justice with this incredibly detailed Lego model. Not only is the scope that Aaron has gone for to emulate the 'Ultimate Collectors Series' line of Lego's Star Wars toys impressive - there's over 3,000 lego pieces in it, and the landspeeder itself is 2 feet long - but the detail on it too is remarkable. Blending the use of smooth-surfaced tile pieces and the traditional studded-lego panels gives the whole model a really interesting textural look, and the fact that it's just covered in little bits and details really makes it stand out. I'd say I'd want to pick it up and swoosh it around, but 3,000 lego bricks probably mean you could bludgeon someone to death with this thing. Beautiful, and deadly! Why, that's the best kind of lego build. You can see plenty more pictures of the build over at Aaron's Flickr account.